THPBlog: Green Diamond Resource Company to log near the Korbel Mill and Blue Lake, CA. Green Diamond Resource Company to log near the Korbel Mill and Blue Lake, CA. 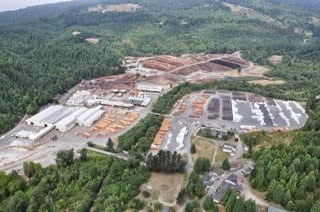 This THP is adjacent to the town of Blue Lake and the Korbel Mill near Highway 299 at an elevation of 150 to 1,100 feet. Green Diamond Resource Company is planning a mostly commercial thin tractor and cable logging operation on steep and unstable slopes in redwood, grand fir and Douglas fir forests. The THP area flows into the North Fork of the Mad River and the Mad River which is listed as impaired for sediment, temperature and turbidity and contains coho salmon, chinook salmon, steelhead and coastal cutthroat trout. There are 16 unstable areas mostly related to unit C including steep headwall swales, over steepened banks, earthflows, debris slides, and rock slides. 11 road drainage sites are planned for work including rocking, dip construction, culvert repair/replacement and restoration of washed out crossings. Southern torrent salamanders were seen along Sullivan Gulch and along the tributaries of the North Fork of the Mad River. Coastal tailed frogs were reported to be near units B and E, and also along the North Fork of the Mad River. There are spotted owl nesting territories within .5 mi of units A,B,E and F. More information is available on the THP Tracking Center website.